When Omar Hamoui left Google a few months after selling AdMob to the search giant for $750 million, he set up shop with mobile engineer Mike Rowehl as Churn Labs. Today at Disrupt NYC, we get to see the first product churned out by the labs: Gnonstop Gnomes. Gnonstop Gnomes is part social game, part mobile photo app. 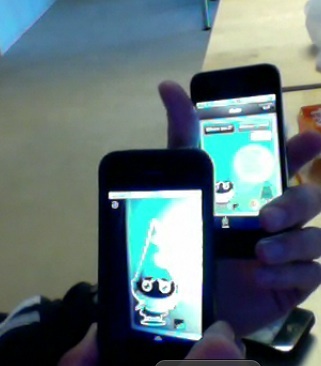 You take pictures with your iPhone or Android camera and insert an image of a gnome into the picture. 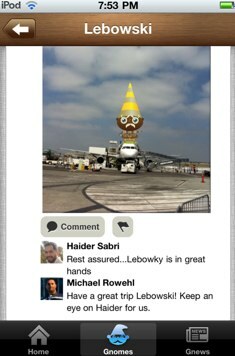 The app marks the location of each picture and you can follow where the gnome has been. “Wouldn’t it be cool to have a gnome in your pocket,” asks engineer Haider Sabri, “all the while you are getting updates on who your gnome is, where he is and what he is doing? The social part comes in when somebody else with the same app “Lyfts” the gnome from your phone to theirs. They do this by grabbing the gnome from your screen with their camera and making a lifting movement. “What we were thinking,” says Hamoui, “is there a way I can get drag and drop to work between devices. Could I drag and drop through the screen.” Once the gnome is transferred to their phone, they can start taking pictures with it, and you can keep on following its journey as it gets passed along. Gnonstop Gnomes is an open-ended experiment in social mobile gaming. Some people might send their gnome on a mission—to find the Eiffel Tower, for instance—and see if it gets there. Others will just take random pictures of gnomes. The ability to pass along the gnomes could lead to all sorts of interesting social dynamics. At the very least, a new meme is likely to be born. Get ready to start seeing gnomes everywhere. Dave Samuel, Freestyle Capital: Lyft looks like Bump, Is that something you might leverage through an API. Omar: Yes, that is a project we have going right now. Chris Dixon, Hunch: Omar is one of the most successful entrepreneurs of the last decade, so if he says gnomes are next . . .
Dave Samuel: You are one of a few key entrepreneurs who have created these little labs. How is that going? Omar: I started late last year. What you are finding is that when somebody is in a situation were they can do whatever they want, they go to the beach or whatever but for us this is what we want to do. It is not the most efficient way to make money. Soraya Darabi, Foodspotting: Why Gnomes?